If you’re having problems with Yahoo Mail sign in, you may be able to find the answers to your questions here. I, as a long time Yahoo Mail user, would like to help answering some of the most common problems you would face during the process of Yahoo Mail sign in. I do not represent Yahoo and my website is not affiliated with Yahoo in any way. So, whatever written in this post are purely my experiences from trials and errors with the sole purpose of helping people who may have met the problems that I went through before. The information may not be updated. If in doubt, please seek help elsewhere. Yahoo Mail login used to be just for the sake of email sign in. 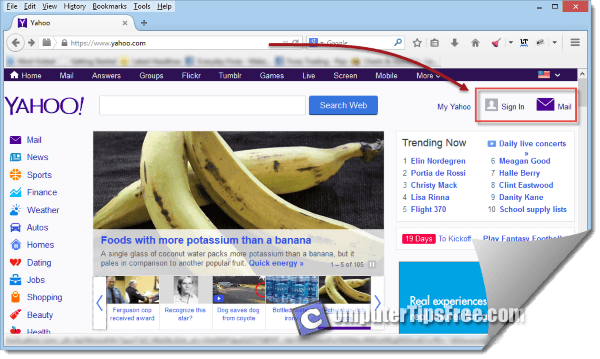 Now Yahoo lets you access to more of its feature by a single sign in. That includes Yahoo Mail, breaking local, national and worldwide news, finance, music, movies, sports and more. You may have missed the Yahoo Mail sign in page before you came in here. The Yahoo.com login form used to be right on its website homepage and ever since a major update, it moved to another page. It isn’t hard to spot it though. The link to the sign in page is at the upper right corner of Yahoo homepage (as shown in screenshot below). The link will direct you to a page where there’s a login form on the right hand side and that’s what you’re looking for. After logging in, you will usually be directed to the Yahoo Mail inbox page where all your emails are. 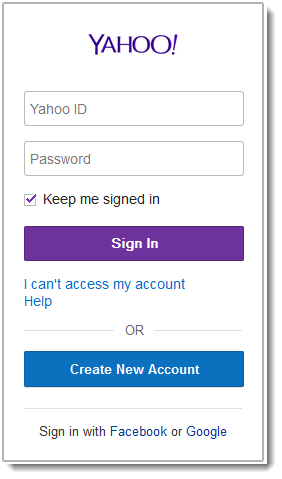 Alternatively, you can go to the Yahoo login page directly via this address: https://login.yahoo.com/?.src=ym&.intl=us&.lang=en-US&.done=http://mail.yahoo.com (works as of August 2014). Screenshot from Yahoo website. Yahoo and the Yahoo logo are trademarks of Yahoo! Inc.
Before entering your username and password, make sure you’re on the right webpage with the correct and genuine URL address. I can’t stress this enough, you must always make sure that you’re on the correct webpage with the correct URL address before entering any account credentials, no matter if you’re logging into Yahoo Mail, Gmail, Hotmail, bank accounts, or whatever that is important to you. The reason is that there are many phishers and hackers out there trying to steal your account information by leading you to their fake webpages that look nearly the same as the real original ones. Double check every time before you login to Yahoo. This is one of the most common way how people lose their accounts and worse, their email privacy. If you are looking for Yahoo.com sign in with Facebook, you’ll have to first go to the Yahoo sign in page (refer to the previous paragraph about yahoo login page). In the login form, click on the link “Sign in with Facebook”. A new tab will pop up asking you to login to your Facebook account. If you’ve already signed in previously, another tab will appear asking for permission to access your account info “Yahoo will receive the following info: your public profile, friend list, email address and birthday.” Press Okay. 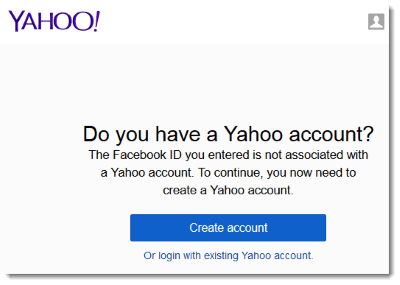 You’ll be redirected back to Yahoo login page and this time you’re going to sign in with your Yahoo ID so that you can associate your Yahoo account with your Facebook account. After doing so, the next time you click on the yahoo sign in with facebook link, you’ll be automatically logged in and redirected to inbox page. Select “This server requires an encrypted connection (SSL)”. Set the encryption type to SSL or TLS. When you’re done, click OK and restart Outlook. It should starts receiving emails into your inbox now. If you ever in doubt if someone else has logged into your Yahoo Mail before, or that you’re suspecting that your account has been hacked or signed in without your authorization, you can check your Yahoo login history for IP, location and some other details of your Yahoo account’s last logged in. To access to the Yahoo login history page, first sign in to your account, from the Yahoo Mail page, click the setting icon on the top right corner of the page. Click on “Account info”. From the newly opened page, under Sign-in and security, click on “View your recent sign-in activity”. You can view the date,time, access type, event, IP address and location of recent login. Any login attempt, no matter if it was a Yahoo messenger login or a Yahoo Mail login, it will be there. Some people have asked me how they can clear or delete the history. Well, I don’t think you can because doing so would void the purpose of the history list. If there’s any evidence of unknown login attempts, you’re advised to change your Yahoo Mail account password immediately, and if possible apply for second sign-in verification to better secure your account.